Lake Faguibine French West Africa. 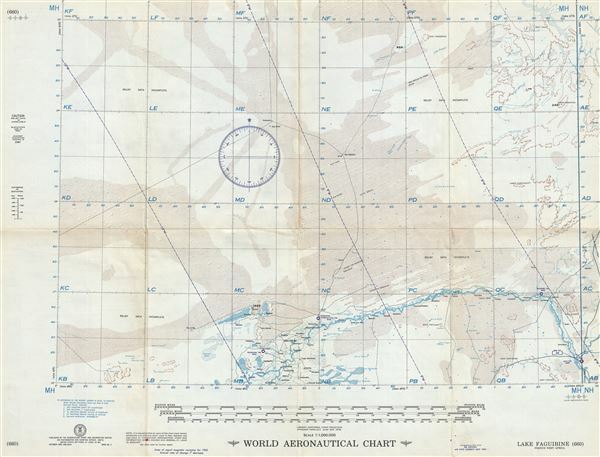 This is a scarce 1955 U.S. Air Force aeronautical chart or map of Lake Faguibine, Mali, and its surrounding area. It depicts from Gao along the Niger River west as far as Hi Tassel well and north to Mont Todac, covering the southern part of the Great Sahara Desert. The map is highly detailed, noting dunes, rivers, mountains, lakes, cities and other hydrographical and topographical features essential for the air pilot. Verso of this chart features legends and a world aeronautical chart index. This chart was published by the USAF Aeronautical Chart and Information Center and was issued as chart no. 660. First issued in 1953, this is the fifth edition revised to Nov 1955.